Through our advocacy efforts, we're fighting to preserve Indiana's public schools. All students, regardless of their ZIP code, deserve the support, resources and time to learn. 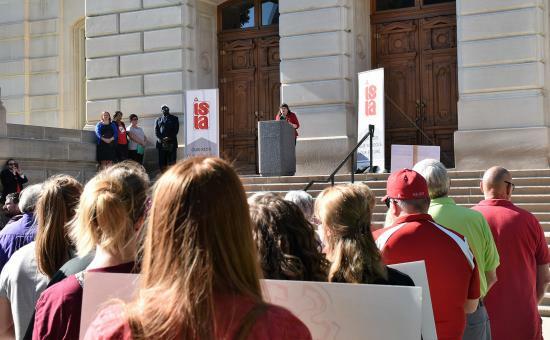 Our advocacy page provides the tools to empower members and public school advocates to stand up for our educators and our kids so that their voices are heard by policymakers. We’ve made tracking education legislation throughout the session easier by categorizing bills and giving key details on their status – helping you be an informed advocate. Join the growing ranks of Hoosier public school supporters who are using ISTA's advocacy program. Through our efforts, we're fighting to preserve public schools as the foundation of American democracy, along with the right of ALL students to an excellent education. Brush up on your civics lesson with this handy visual on how a bill becomes a law in the Indiana Statehouse. Our Advocacy Toolkit provides advocates the information and tools needed to be an effective supporter on behalf of students and strong public schools in their communities.